Growing up my Grandma Georgia would tell me about our Irish heritage and how our ancestors came over from Ireland. They were the O'Kennedy's in Ireland, and upon moving to New York they dropped the "O" from their name. She told me about the castle that our family once lived in and had a photo of the castle framed on her wall. I always knew I would visit the castle someday, at some point in my life. Growing up I wish I would have paid more attention to her stories, or tried to remember in more detail. When I started to show an interest in learning more she wasn't able to recall the details. I reached out to her younger brother, my Great Uncle Ed, in hopes that he'd have something to share with me. A few months after I made contact with him, an envelope showed up in my mailbox with two photos of the castle with his hand-written notes on the back detailing the year he visited and the address of the castle. Receiving those details were an absolute dream come true. The castle is named Necarne Castle, but is also referred to as Castle Irvine. I kept the photos in my passport holder on this trip, to see how much, if any, the castle had changed since our last family members were here. 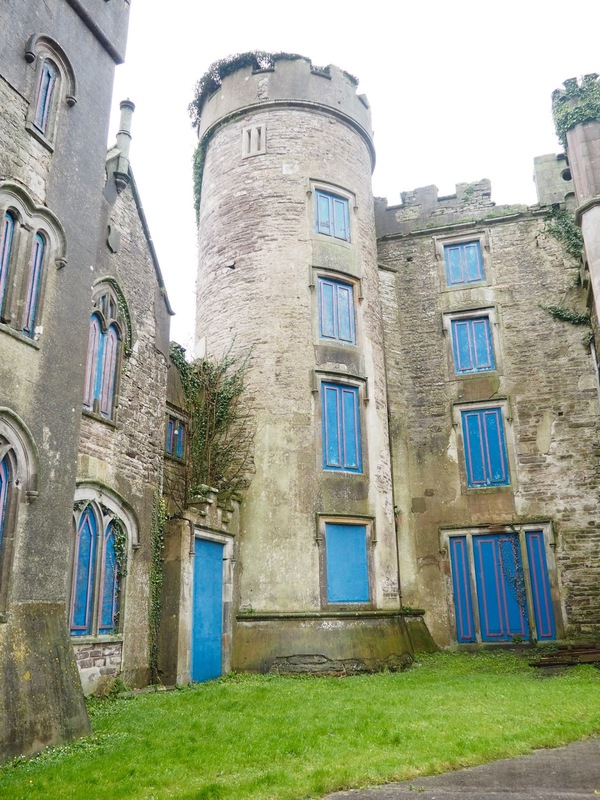 The castle is located about 3 hours north of Dublin, in the town of Irvinestown, Northern Ireland. After a stressful drive north, I peeked at the GPS when we finally arrived to Irvinestown and were about 5 minutes away from the castle. I got a bit nervous. I've been wanting to see this place for the better part of my life and I couldn't believe I was so close. The GPS told us to take a left and the road was closed and blocked off. We got a bit creative and re-routed our path to the old equestrian college that was on the castle grounds. We arrived a few minutes later in the parking lot. As we got out of the car and walked in the direction of the castle I had a thousand thoughts floating around in my head. I had always envisioned what the castle would be like and I hoped the reality lived up to my expectations. We had to walk around the equestrian college's facility so there was some paths, stairs and walking around buildings. I just wanted to be there already! Once we finally had the castle in view I couldn't believe my eyes. Necarne Castle was built in the 17th century and the last time the castle was occupied was 1945. There hasn't been any restoration work done since then. It's in critical condition and continues to deteriorate. The windows and doors have been boarded up for decades. It's sad to see such a beautiful building falling apart, with no plans to save it. Northern Ireland now owns the castle and through extensive research on my part, I've found that there is no budget to save Necarne Castle. There are many local groups advocating for restoration, but it doesn't seem there's an interest. I can only imagine how amazing the castle was in its prime. I'm thankful to have seen something that was such a special place to my ancestors.